RICHARD SOLOMON ARTISTS REPRESENTATIVE: Mark T. Smith // Zika! Taking a humorously dark stance on 'the Florida state bird', American painter Mark T. Smith has created a personal piece showcasing a topic that's all the buzz as of late, mosquitoes! 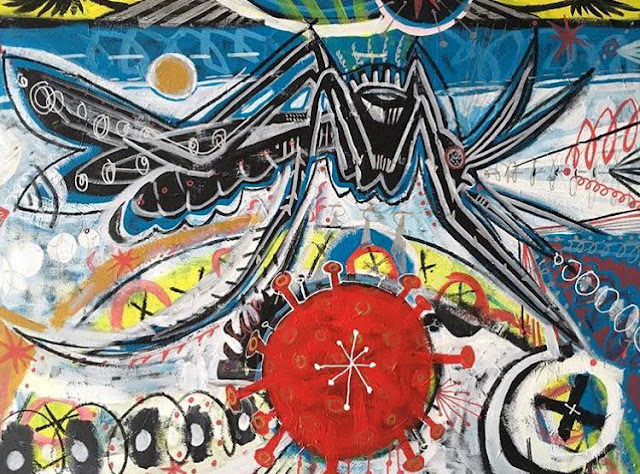 This mammoth mixed-media work of art, sizing up at a whopping 30"x40", portrays the infamous insect whose bite possesses an even bigger problem to humans since they can carry the Zika Virus; a virus which, following the recent Brazil outbreak, has been the topic of conversation amongst the Western Hemisphere. Zika's symptoms being similar to a flu in adults, but whose effect is particularly more of a threat to pregnant women since it can induce microcephaly in babies, the virus is spreading rampantly throughout South America, the Caribbean, and along all warm climates, so be on the look out for these pesky bugs! Zika 'The Florida State Bird', 30" x 40"